my year is c.2035. i'm laying the groundwork. i'm gonna be HUGE then! Wow, I love it, @Coel! Calling your shot like the Great Bambino! Please don't forget us when you finally arrive. sorry sam. i'll be dead. i'll see what i can do but i may not have all my faculties when i'm dead. Thanks! 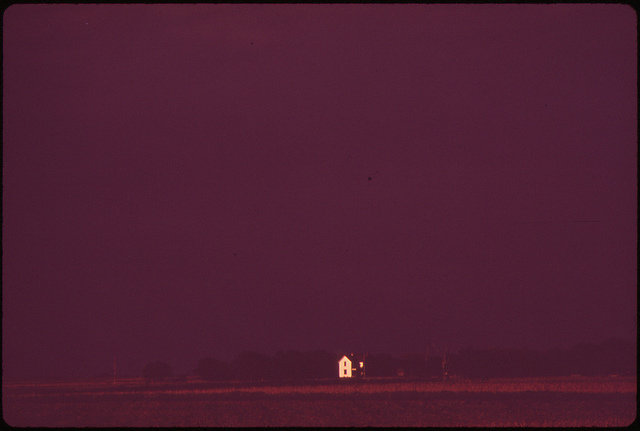 The caption on it reads: "Farm house at dusk. Rain clouds darken the sky, May 1973." Photographer is Charles O'Rear. i wonder if that dot in the sky is a blemish on the photograph or an et-occupied craft. obviously it's one or the other. I was in a farm-ish yard today, where young children played on big low apple tree branches while unpenned turkeys, chickens and goats did their things -- peacocks and other birds were inside wire nearby. I stood in the shade a good while just...enjoying, and eventually engaging with the kids a bit, one of whom (probably age five) seemed to know all the lyrics to "Everything's Up to Date in Kansas City." It was a lucky summer idyll. Recommend it. Now that's the kind of reverie this comment board was made for, @SBP. Thank you for stopping by! my kind of reverie is only tolerated here. Dave, hold on i'll get her. Dave B! This is Sam. Mayuko is on Saturdays, but I welcome you and any Dive 75 patrons. Great to see you, Melinda! Right on Sam! Good stuff! yeah melinda. i'm switching back and forth - although i've been here pretty much the whole time so far. Ah, it pains me to compete with, Mayuko! yeah you're both on the same team. i get to hear your show probably almost 2X to every 1X i catch Mayuko's, so please forgive me if i go for a while. but i ain't leaving this. This is not a competition. Please, no wagering. My un-competitive uncle, Michael! Welcome! Wayne Marsh was just beginning to see the light. I mean that Commentary is pretty much an interpretation of the standard "I'm Beginning to see the Light. I am neither Melinda nor Mayuko. But I am listening and, in this heat, glistening. This trio is pretty great. Masada String Trio is easily one of my favorite Zorn projects. Sounds like an old Star Trek episode, Melinda. Are you one??? taking an occasional glance at Mayuko's comment board, and the Dave Hill show energy there, it seems to be an extension of my sister's shithead husband who's stumbling around, doing ridiculous things. The air is dead. Long live the air. dead air within a track is not dead, it's only sleeping. Dead air...like dark matter. Seemingly empty, but SOMETHING's there, exerting influence, affecting, affecting. Been watching the tankers laying retardant on the nearby fires. The setting sun is bright orange. 23 Wolves and Santos L Halper, thank you both for dropping by and lending me your ears for a spell. Been here for about a half hour, good fun! Ah, glad you made it, NGH. Got some classic UK Jungle coming up shortly. Saw a reporter doing his standup what seemed like 75 feet, maybe, from house behind him getting retardant dropped on it from chopper. Didn't seem the smartest safest idea as it fell near him and nearly dusted him with impact spread. Al Pacino Needs Our Help. Oh, no...what can we do for him, Good Guy?! We must pray and tell him he is not real. Oh, my...that bad, huh? I always liked Pacino, but somehow I'm not surprised to hear this from you, Good Guy. Could be gravel rash suffering but it could be something even more serious. Oh god that sounds ROUGH, ngh!! You alright? Thanks Sam, have a good night! have a good night all, at the very least.